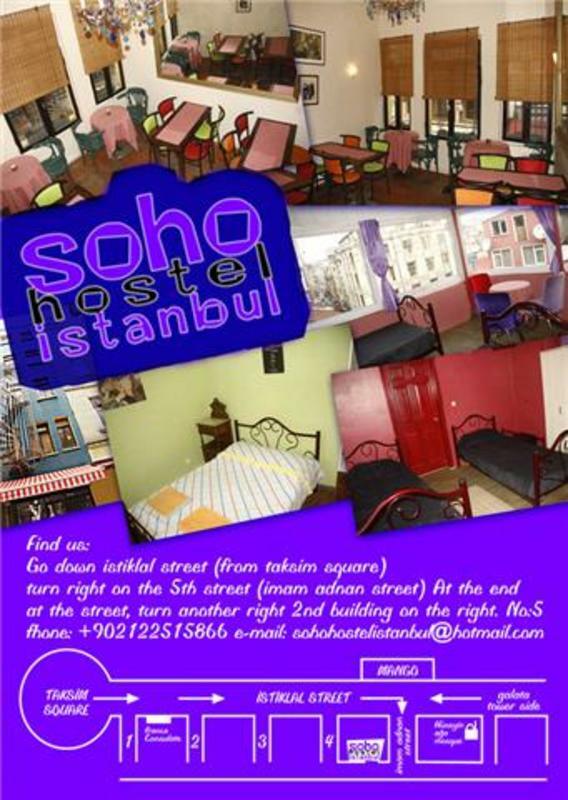 A new,clean,comfortable,and very cheap hostel for young travellers,students,and tourists at Beyoglu,TAKSIM.Just 50 meters from Istiklal St.(the famous pedestrian street). 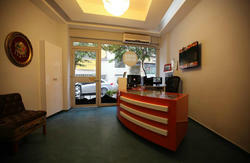 Soho hostel,a new,clean,and comfortable hostel,is offering great location,service,and security with lowest possible prices.İn our common rooms with Tv and free internet,Wifi access,,read,listen to music,meet new friends or barrow a book from the library or just realax in the gaming room,you can take free Backgammon lesson,play cards,poker,chess,etc...Cook your own meal in our free guest kitchen and save some more...(Only a minute walk to DIA Market). Yes,you can bring and drink your own beverages,including alcohol in our common rooms.NO PLACE else allows it in Istanbul!Choose from male,female or mixed dormitories,couple of double and triple rooms.Common showers on the corridors.Free hair dryer.linen. Good people deserve good things.And we try our best.Let's get together and feel allright! Payment by cash only on arrival day.Cancellations should be made at least 2 days before arrival date,otherwise 1 night is charged to credit card.All taxes included. 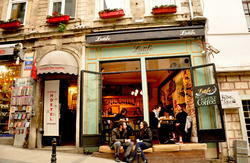 Our Hostel is located near Taksim Square in Beyoglu(over 3 million people visit Beyoglu each weekend!!! 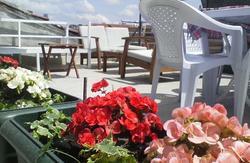 )Just 50 meters from İstiklal St.(the famous pedestrian street).Welcome to the jungle party animals...Our location offers you to stay close to Taksim Square,Public Transportation(subway,tram,funicular,bus stations,ferries).And walking distance to Galata Tower,Dolmabahe Palace,and Grand Bazaar.You can easily reach to Entertainement,over 2000 Bars,Restaurants and Nightclubs,Shops,Shopping Centers,Museums,Art Galeries,Churches,Synagoges,Bookstores,Theaters,etc...15 minutes by walk to the Blue Mosque,St Sophia,and Topkapı Palace. MAP AND DIRECTIONS:From Ataturk Airport,you can take the shuttle buses in every 15 minutes to Taksim Square.The first bus is at 4:00 AM,and the last one at 1:00 AM.When you arrive to Taksim Square,walk down İstiklal St.On the 5th street (Imam Adnan St.),make a right.At the and of the street,turn right.We are the second building on the right.Just come inside and join us.